This is the SEA Change Nation! 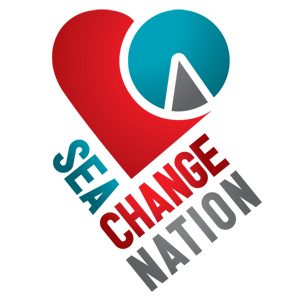 After years of pouring our souls into researching how we could best use our passion and strengths to serve a higher common good, we are pleased to announce SEA Change Nation Inc.
We are a Social Entrepreneurship (1) Academy, (2) Accelerator and (3) Alliance uniquely designed to transform youth into social entrepreneurs. The future stability of our world is dependent on the growth of social entrepreneurship. Unlike the current evolution of our economy, social entrepreneurship has a balanced value system that equally respects (1) ALL People, (2) OUR Planet and (3) Financial Profit (commonly referred to as a triple bottom line). The essence of social entrepreneurship is a deep understanding of who you are as an individual and how you are connected to the world as a whole. We define this relationship between self and a higher common good as passion. Passion is unique to each of us. There are over 7 billion (and counting!) different passions in the world. Our lifelong purpose is to discover our own unique passion and channel it into making the world a better place. Passion fuels social entrepreneurship. At SEA Change Nation Inc. we believe YOUTH are the key to discovering the solutions to the complex societal challenges we currently face. We have therefore reached a point in history where we can no longer afford to leave their naturally inherent compassion and creativity untapped. With this in mind, we have developed our innovative 3-SEA Change Model. It’s unique design creates opportunities for YOUTH to explore, experiment and discover their passion. Through the interconnected actions of (1) Learning, (2) Launching and (3) Sharing, we have engineered a catalyst for the organic evolution of a balanced, diversified, compassionate, respectful and creative economy. (2) LAUNCH in The Social Entrepreneurship Accelerator – A social enterprise incubator that accelerates the launch of youth-powered social enterprises after the social entrepreneur’s graduation from our SEA Change Academy. (3) SHARE inside The Social Entrepreneurship Alliance – An alliance of social enterprises launched by our SEA Change Accelerator and powered by our 3-SEA Change model. We dream of an economy that creates opportunities for ALL people to earn a living doing what they love. We believe doing what you love is the key to creating a poverty-free society of wealth, health, and happiness for ALL people. To achieve this epic vision of our future, it will take an army of youth discovering their passions and souls and pouring them into businesses aiming to make the world a better place. BE Change. SEA Change. This is the SEA Change Nation.